Secretary of State for International Development Penny Mordaunt has warned recipient governments that they face cuts in UK aid if they don’t “put their hands in their pockets”. Her warning is grounded on a claim of public concern: “Nagging doubts persist for many people, about what we are doing, why we are doing it … especially when there are domestic needs and a national debt to address.” It is a compelling point but, as it turns out, one for which there is actually very little evidence. The most recent YouGov/Times survey poll asked Britons what issues they considered most important among those facing the country: Brexit, health and the economy topped the list. The potential misuse of foreign aid funds, as one would expect, did not even register. These days I am writing a paper on how the STAAC programme that I work on in Ghana has managed to chart a bespoke adaptive programming course to anti-corruption. There’s a lot in there about embedding PEA into everyday practice, about being smart and adaptive, about doing things differently. And you would expect as much from a DFID programme designed with TWP/PDIA buzzwords in mind. But the exercise of reflecting on two years of experimentation with the approach and evolving relations with partners has also made me ask questions about the broader dilemmas of anti-corruption programming. 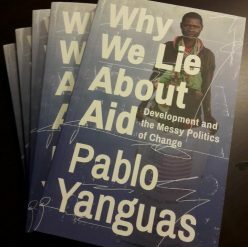 The challenges of combatting corruption are well known: informal institutions, social norms, principal-agent and collective-action poblems (I have written about some of these in my book). In fact, corruption tends to be one of the most difficult components of the broader public sector agenda. Naturally the anti-corruption community – such as it is – appears to be developing a new consensus that challenges conventional approaches to anti-corruption, compiling evidence of what works, and asking for a smarter way of tackling an intrinsically difficult problem: we need to “move away from thinking of anti-corruption as a blueprint”, finding solutions that are “localised and adapted to individual country contexts”.